I know that when most people think of a marketing buzzword, they think of obnoxious, over-used industry jargon that means nothing to them. So, for this post, we’re bringing it back to the basics. Maybe these aren’t the most frilly, synergistic, growth hacking buzzwords you’ve ever heard, but they’re the marketing buzzwords we’re focusing on this year. Local Search Marketing – Local search marketing is the foundational, localized digital marketing strategy we provide to franchise and local businesses. Local search marketing involves optimizing your business’s online information to give consumers and search engines everything they need to know about you. Analytics – You can think of analytics as the analysis of data. If you’re running any kind of marketing or advertising campaign, analytics are key to monitoring and improving your performance. Our digital marketing strategists use Reveal, our marketing analytics dashboard to track (and constantly improve) the success of the digital marketing services we provide. You should be using your analytics to track the next few buzzwords! Conversion – A conversion happens when a customer takes the action you want them to take. Conversions tend to be some sort of interaction with your business or brand. It could be anything from filling out a form to getting directions or making an e-commerce purchase. Impression – Impression is an advertising term that measures the amount of people who have seen your ad. CTR – CTR is short for click-through-rate. Your CTR is the amount of clicks your paid ads get (as opposed to someone just viewing your ad without clicking). Your CTR can be determined by doing a little math. (Sorry.) Divide total ad clicks by total ad impressions and you’ll get your click-through-rate. ROI – ROI stands for return on investment (how much money you've made from an investment). Marketing ROI is the amount of profit you've made from your marketing efforts and is usually measured in percentages. 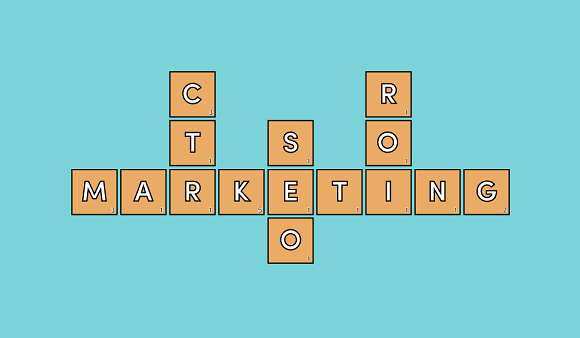 Side note: we created this marketing buzzwords video for Scrabble Day! Optimization – Optimization is the process of (you guessed it) optimizing something and making it better. You can optimize your website for conversions or sales. You could optimize landing page copy to improve sales or just optimize your marketing strategy to make it even more successful. Storytelling – Storytelling is the art of weaving your business’s message into a story or narrative. Businesses can use storytelling to create marketing materials like blog posts, videos or web pages. You can also convey your brand’s history and mission through storytelling. Rather than a hard sell, you can paint a picture or tell a story that engages your audience and makes them remember you. Storytelling can humanize your brand and make you more than just another business. It gives you a face and a tale that people can relate to. Brand Compliance – Brand compliance consists of making sure your brand image (logo, signage, slogan, any visual elements) and brand voice are consistent across all media. Brand compliance is important for all businesses, but it's usually at the forefront of franchise marketing. Influencer Marketing – Influencer marketing is the act of using influencers in your marketing campaign. An influencer is a thought leader or a person who has a large industry following. Transparency – Transparency means being open and honest about your business practices. Transparency is something we talk about a lot. We practice transparency by giving our clients access to their analytics dashboard and having monthly conversations with them to discuss everything we’re doing to constantly improve their marketing ROI. The digital marketing industry jargon doesn't slow down for business owners. This article clearly lays out for the novice what these terms mean.